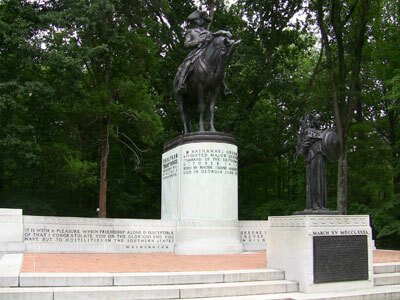 Description: The monument consists of two bronze statues, the larger of which is Nathanael Greene on a stallion. The smaller figure is a representation of a classically-garbed Athena with a shield and laurels. The monument stands over 27 feet tall. Below Athena: MARCH XV MDCCLXXXI / IN THE MANOEVERING THAT PRECEDED IT, IN THE STRATEGY THAT SIGNALIZED IT, AND IN THE RESULTS THAT FLOWED FORM IT, THE BATTLE OF GUILFORD COURTHOUSE IS SECOND TO NO BATTLE FOUGHT ON AMERICAN SOIL. OVER THE BRAVE MEN WHO FELL HERE THEIR COMRADES MARCHED TO ULTIMATE VICTORY AT YORKTOWN, AND THE CAUSE OF CONSTITUTIONAL SELF GOVERNMENT TO ASSURED TRIUMPH AT PHILADELPHIA. TO OFFICER AND PRIVATE, TO CONTINENTAL SOLDIER AND VOLUNTEER MILITIAMAN, HONOR AND AWARD ARE ALIKE DUE. THEY NEITHER NEED DEFENSE NOR EULOGY BUT ONLY JUST RECOGNITION. A GRATEFUL NATION ERECTS THIS MONUMENT, THEREFORE, AS AN EXPRESSION OF ITS SOLEMN PRIDE IN THE MEN WHO FOUGHT HERE, OF ITS IMPERISHABLE DEVOTION TO THEIR MEMORY, AND OF ITS UNALTERABLE CONFIDENCE IN THE PERMANENCE OF THE PRINCIPLES WHICH THEIR EXAMPLE VINDICATED AND THEIR BLOOD CONSECRATED. Materials & Techniques: Granite base, bronze letters and statues. Unveiling & Dedication: Local Boy-scouts and the Guilford Militia led a parade which included 700 soldiers. According to the ceremony's program, addresses were given by the Governors of North Carolina, Maryland, Delaware, and Rhode Island, as well as by the the Lieutenant-Governors of Georgia and South Carolina. Senator Lee Overman of North Carolina presented the statue. Charles Randolph Thomas gave a speech as well. Unfortunately, it rained during the ceremony. 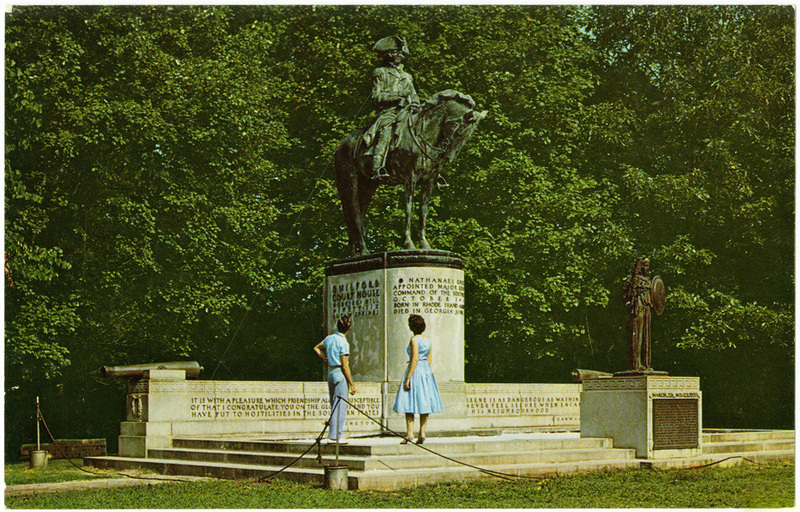 Post dedication use: Photos show that the monument once had cannons on either side of the statue. They have since been removed. Controversies: The monument was savagely vandalized in July 1989. Its granite base was severely chipped and covered with spray-painted graffiti. Fifty-eight of the monument's sixty-three granite blocks had to be replaced, as did a quarter of the approximately 450 bronze letters that are applied to the monument's granite faces. 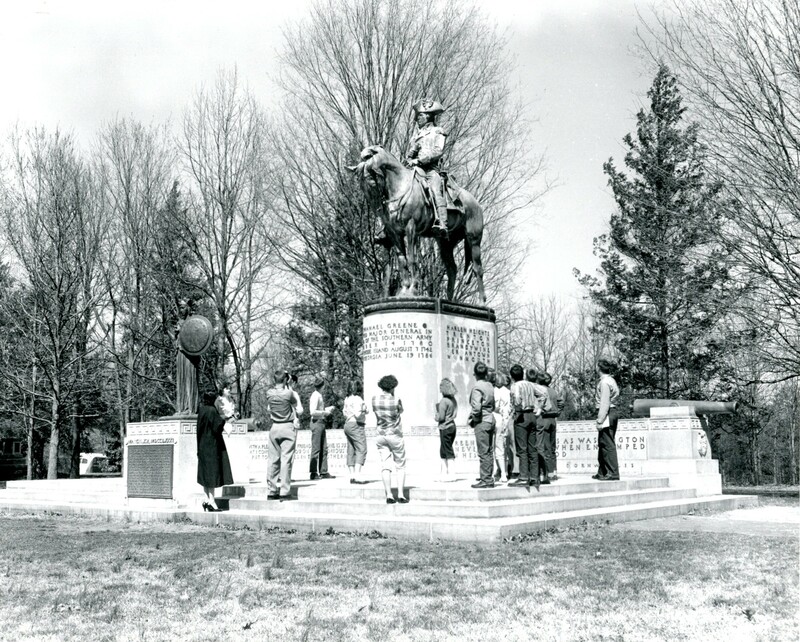 A re-dedication ceremony was held April 19, 1991 (on the 216th anniversary of the beginning of the Revolutionary War). The cost of restoration approached $200,000 and was covered by donations from local individuals, businesses, civic organizations, and National Park Service. Much of the graffiti was anti-police. It was theorized that the motivation behind the vandalism was a photo of the Greensboro police department in front of the monument used on the cover of the 1989 city phone directory. Landscape: The placement of the monument is due to the elevation of the site, which is one of the highest points in the park. Proximity to the train station also played a role. An Amphitheater was later built in front of the monument. The monument was completed in 1939 and has since been partially dismantled, reducing the visual impact. Though the monument has not moved, other monuments within sight have been removed and added over time. A line of monuments along the Old Battle Ground Road (now a walking path) was previously visible running east from about 120 feet to the to the North. The nearest was Clio, The Muse of History, (removed in 1937), followed to the east by the Battle of Alamance and James Hunter Monuments (moved to Alamance County), The Battle of Kings Mountain Monument (removed in 1937), and lastly the David Schenck and Joseph Morehead (both moved to new locations in sight of the Greene monument). The former location of many of these monuments is now overgrown. Additionally, the train station and railway (now a bike path), the Battle Monument, and the Davidson and Nash Arches were easily seen from the Greene monument. Today, the Hooper-Penn monument and the Reynolds monument--which sits very close to where Clio once stood--are readily visible from Greene; a few others are noticeable in the distance. Click here to explore the site of the Greene Monument.